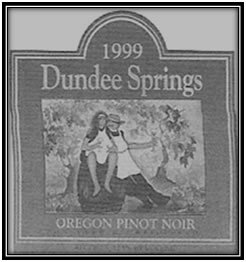 Dundee Springs Winery was established in 1989 by Mary Lynne Perry and Chris Bower. They purchased an old 110 acre walnut and plum orchard at the northern edge of Dundee and planted a 60 acre vineyard, called the “Perry Bower Vineyard”. The winery’s first release was a 1992 estate Pinot Noir. It won a gold medal at the San Diego International Wine Exhibition. The winery produced about 3,000 cases annually. Dundee Springs was located at 9605 Fox Farm Road, Dundee, OR. In 2003 the winery was sold to Steve and Paula Black and renamed “The Four Graces” after the Black’s four daughters.